Acochain.com – Bitcoin (BTC) needs to climb at least anther $350 to confirm a long-term bullish reversal, technical charts suggest. The leading cryptocurrency by market value is currently trading at $3,903 – having rallied 24.8 percent from this year’s low of $3,122 seen in December. This positive trend has spurred hopes that the sell-off from the late 2017 record high of $20,000 is over. Validating that argument are a number of long duration technical indicators flashing early signs of bullish reversal. To name a few, the weekly moving average convergence divergence (MACD) is at its most bullish for over a year. The money flow index, which takes into account both bitcoin’s price and trading volume, is also trending north, validating the bullish divergence created in December. That said, BTC is yet to invalidate the most basic of all bearish technical indicators – a lower high, lower low. On the weekly chart, BTC has been charting regular bearish lower price highs and lower price lows since January 2018. These were essentially shallow bounces that ended up recharging the engines for a drop to further lows. The last lower high of $4,236 created on Christmas Day, however, failed to challenge the preceding lower low of $3,122. And since then, BTC has been creating higher lows in the region of $3,300. While the latter is evidence of seller exhaustion, a bullish reversal would only be confirmed if and when BTC prints a higher high above the Christmas Day lower high. Put simply, a break above that level is needed to mark a successful transition from bearish to bullish trend change. So, with bitcoin’s price currently trading at $3,890, that target is still $350 away. As seen above, the previous bear market ended with bitcoin charting a higher low near $230 in April 2015. The bullish reversal was confirmed in November 2015 when BTC convincingly breached the bearish lower high of $297 carved in March 2015. Acohain.com – Ethereum price failed to break important resistances versus the US Dollar and bitcoin. ETH declined sharply, but the bulls might protected the key $166 and $165 support levels. Yesterday, we saw a fresh increase in Ethereum price above the $172 resistance against the US Dollar. The ETH/USD pair even settled above the $172 level and the 100 hourly simple moving average. There was a fresh rally in bitcoin price above $5,500, which pushed ETH price above the $175 level. However, the bulls failed to gain strength above the key $176 and $177 resistance levels. A swing high was formed near $177 and later the price started a sharp decline. It broke the $174, $172 and $170 support levels to move back in a bearish zone. There was also a close below the $172 pivot level and the 100 hourly SMA. The price traded close to the $166 support level and a swing low was formed near $167. At the outset, the price is consolidating losses near $167 and it is testing the 23.6% Fib retracement level of the recent slide from the $177 swing high to $167 swing low. It seems like the price might correct in the short term towards $170 or $172. Having said that, a close above the $172 level and the 100 hourly SMA is must for a decent upward move. The 50% Fib retracement level of the recent slide from the $177 swing high to $167 swing low is also near $172. If there is a close above $172, the price may revisit the $176 and $177 resistances. If not, the price might test the $166 or $165 support level in the near term. Looking at the chart, Ethereum price clearly trimmed most its gains and broke the key $172 and $170 supports. If sellers remain in action, there are chances of a downside extension below the $165 support. As long as the price is above $165, the bulls might attempt to push the price above $172. Hourly MACD – The MACD for ETH/USD is currently heavily in the bearish zone, with negative signs. Hourly RSI – The RSI for ETH/USD declined heavily below 50 and it is currently near the 27 level. Acochain.com – With bitcoin’s (BTC) move to five-month highs Tuesday, a notable bull cross of key moving averages has formed for the first time in nearly four years. The crypto market leader jumped to $5,627 on Bitstamp earlier today – the highest level since Nov. 18 – having revived the short-term bullish case with a repeated defense of key support at $5,170 last week. Meanwhile, the 50-day moving average (MA) has crossed the 200-day MA from below, confirming a long-term bullish pattern known as a “golden crossover” in technical parlance. This is the first golden crossover since October 28, 2015. Many analysts consider the indicator an advanced warning of stronger price gains in the long term. The crossover, however, is based on moving averages, which are backward-looking in nature. For instance, the 50-day MA is based on 1.5-month old data, while the 200-day MA responds to more than six-month-old price action. Hence, the indicator is more a confirmation of the recent bull run, rather than a signal of further price gains. That said, the investor community may take heart from the fact that bitcoin’s previous bull market began just two days after the golden crossover in 2015. As can be seen (above left), the 50-day MA last crossed the 200-day MA from below on Oct. 28, 2015, and prices confirmed a long-term bearish-to-bullish trend change with a close above $319 (July 12, 2015 high) two days later. The follow-through to that positive trend change was strong and BTC went on to reach an all-time high of $20,000 by December 2017. This time round, the confirmation of the golden crossover has been preceded by the violation of the bearish lower highs and lower lows pattern on April 2. While there is a reason to be optimistic, the golden crossover lags price, as discussed earlier. Further, it tends to work as a contrary indicator in the short-term if the market is looking overbought, which looks to be the case currently. The cryptocurrency’s move to five-month highs has pushed the 14-day relative strength index (RSI) above 70 – a sign of overbought conditions. Hence, a price pullback cannot be ruled out in the short term. Supporting that argument is bitcoin’s long/short ratio, which has shed the bullish bias. The ratio of BTC/USD long to short positions on Bitfinex (right) is currently hovering just below 1.00 – the lowest level since early January – having printed a high of 1.53 on April 8. The sharp decline indicates the sentiment has turned from bullish to neutral over the last 15 days. Note that a reading well below 1.00 indicates a bearish bias, while an above-1.00 print represents a bullish market. A close above the April 10 high of $5,466 would establish another bullish higher high and strengthen the case for a rally toward $6,000. However, with the golden crossover accompanied by the overbought readings on the RSI, as well as a bullish-to-neutral shift in the long/short ratio, prices may fail to close above $5,466 or the bullish close could be short-lived. Acochain.com – Bitcoin’s price extended its recent gains today, spiking above $5,500 for the first time in over five months. At 04:00 UTC, the world’s premier cryptocurrency, whose market capitalization accounts for more than half of all other cryptocurrencies combined, picked up a bid and saw its price climb as high as $5,650 in less than 10 minutes on April 23 – its highest price since Nov. 18, 2018. 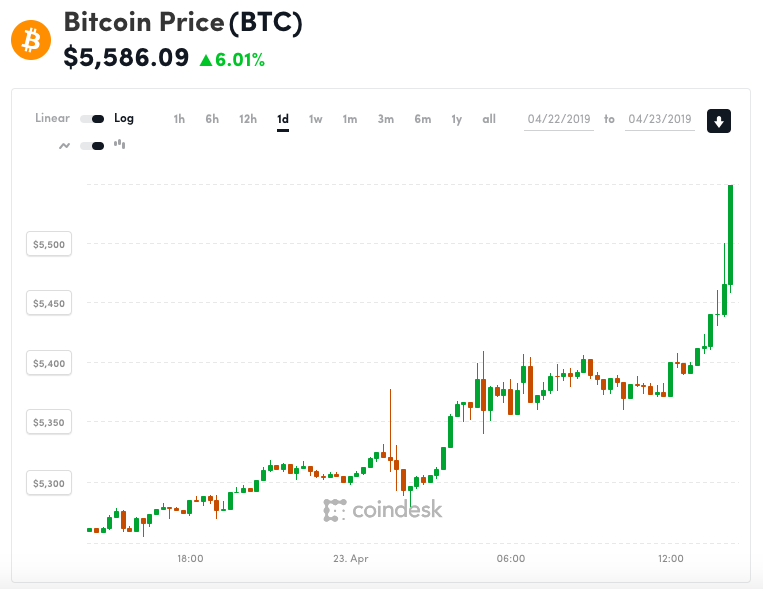 At the time of writing, bitcoin’s price has since pulled back slightly, now trading across exchanges at an average price of $5,586, according to CoinDesk’s price data. Also up roughly 1.48 percent on the day, bitcoin’s individual market capitalization rose to its highest value since mid-November, $96.9 billion, while its percent share of the broader cryptocurrency market, also known as its “dominance rate,” is currently at 53.2 percent, according to CoinMarketCap. CoinMarketCap data also reveals the cryptocurrency’s exchange trade volume reached 15 billion in the last 24 hours, yet those figures may be misleading as suggested by a recent report from asset management firm Bitwise, which identified 95 percent of the reported trading volume on CoinMarketCap to be fake, with only 10 exchanges reporting honest figures. These 10 exchanges combined, which include the likes Coinbase, Kraken, Bitstamp and more, reported $1.7 billion worth of total bitcoin trading volume in 24-hours, according to Messari.io. Generally accompanied by a strong move in bitcoin’s price are similar movements in the USD value of most other cryptocurrencies. Indeed, the broader market is flashing green today with nine of the top 10 cryptocurrencies by market cap rank reporting gains above two percent, the strongest performer of which, Cardano (ADA), is now up 9.71 percent on the day, CoinDesk data shows. Acochain.com – After a token sale on CoinList failed to reach its target, data marketplace Ocean is trying again on crypto exchange Bittrex International. Ocean Protocol has a vision to become the ecosystem for “a new data economy,” its founder Bruce Pon told CoinDesk. With the release of Ocean’s version 1.0 beta network earlier in April, its tokens are ready to be used on the platform, but the company has not quite met its fundraising goal. Through its initial exchange offering (IEO), Ocean aims to raise $6.77 million in bitcoin, following a previous round of over $24 million from Outlier Ventures, Block Asset, Fabric Ventures and Digital Currency Group, according to its listing on CoinList. With its prior 2019 token sales via the Coinlist and Fractal platforms, the firm ultimately raised a total of just $1.8 million, according to a March blog post. If it succeeds with its IEO, it will meet its original goal announced in February for the CoinList sale. “We had seen that an IEO was a good way to have more awareness and a broader distribution,” Pon said, while also granting they still needed to close that budget gap. Its listing partner, Bittrex, has been caught up in a recent dispute with the New York Department of Financial Services over its decision not to grant the company a bitlicense. However, its presence in New York is not relevant to Ocean’s present efforts. Its deal with Bittrex allows Ocean to focus on its core work for this next sale, while Bittrex will market the listing to its large base of users. “They are the ones who are leading the effort to reach out to their customer base,” Pon explained. In particular, he’s optimistic about the company’s user base abroad. “We think there’s a lot more crypto enthusiasts coming out of Asia,” he said. In light of market mood, Ocean has also halved the price of the token from that in the earlier sale, from $0.25 to $0.12. Ocean noted to supporters in its Telegram channel that they should read the full IEO announcement before flipping out. That’s because participants in the original sale will still be able to opt-in to the better deal, Pon explained, and will get a distribution of tokens at the new price. “It was just fair,” he said. The initial circulating supply of OCEAN tokens will represent 22.3 percent of the total supply of 1.41 billion tokens. The greatest portion of future tokens, 51 percent, will be emitted through network rewards for validating transactions, though Ocean has not announced its consensus model yet. The vision for Ocean is to serve as a place where those with large pools of data can share them securely, allowing data scientists to run analyses on them. The data holders will get the analysis they need and the scientists will both get to hone their tools and earn money as they do so. The token will be the medium of exchange for these transactions, but Pon explained it will be also used to stake data sets as a way of signaling quality data. Pon further articulated a much larger vision for the OCEAN token. “What we ideally see for the token is it becomes the reserve currency of the data economy,” he said. For example, he described a future where companies generating large amounts of data (such as autonomous car sensor makers) could fund the development of their product by selling a security token against the future revenue of that data set – a kind of data IPO. “What happens if the people who have bought shares in those data streams start to act on behalf of those data streams to get more channels of distribution?” Pon asked.